Zenetta Zepeda and I met only months ago, but it seems that we’ve been best friends forever! She showcased her handmade ribbon skirts in this issue. 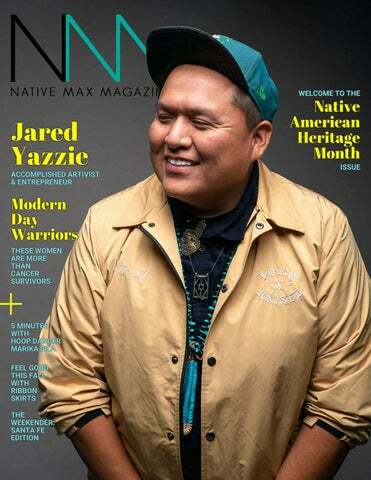 I was so excited to feature my good friend Jared Yazzie of OXDX on this month’s issue! our cover. My girl Zenetta Zepeda (who secretly calls me her manager-mom *laughs*) is more than just a model. She is a full-time college student and creator who designs and sews her ribbon skirts. After she learned how to sew from her grandmother, she started creating her dancing regalia and outfits. For this issue, she wanted to show our readers how to style your ribbon skirts into your #ootd (code word for ‘outfit of the day’) just in time for the cooler fall weather. Her love and appreciation for ribbon skirts are why we included her in this issue. I’m also excited to feature the versatile hoop ninja herself, Marika Sila. She’s well known throughout Indian Country for her amazing videos of her performing hoop dancing, fire dancing and more. Her dancing has taken her across the world from France to Budapest, and beyond. I listened to and fell in love with her story and journey of performing. Enjoy the issue and I’ll see you on our brand new website! Copyright Native Max & Other Media Ventures All rights reserved. 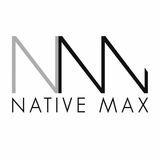 All material in Native Max Magazine is wholly copyright and reproduction without the the written permission of the Publisher is strictly forbidden. Neither this publication nor its contents constitute an explicit endorsement by Native Max of the products or services mentioned in advertising or editorial content. Whilst every effort has been made to ensure accuracy, Native Max shall not have any liability for errors or omissions. We've done our best to acknowledge all photographers. In some instances photos have been provided to us by those who appear editorially and we have their permission in each case to use the images. We apologize if anything appears incorrectly. It will be a genuine mistake. Please let us know and we can give you a mention in the next issue. About the Model: Zenetta Zepeda (Sicangu Lakota/Diné) is more than just a model. She’s a fulltime college student pursuing a Bachelors of Science in Biochemistry with a Minor in World Health Sciences, volunteer at Children’s Hospital in Aurora, Colorado, jingle dress dancer, and creator who designs and sews her ribbon skirts. After she learned how to sew from her grandmother, she started creating her dancing regalia and outfits. Hats: ThunderVoice Eagle Hat Co.
Runway show audience members waiting for the Red Berry Woman fashion show in anticipation. The runway show was on the United Tribes Technical College campus in Bismarck, North Dakota during the UTTC Powwow. Model wearing a menâ&#x20AC;&#x2122;s applique vest by Red Berry Woman. Southern Cheyenne designer Nan Blassingame made the trek from Austin, TX to participate in the fashion show. Crow designer Della Stump brought her creations, which include applique, beads and elk teeth, to the runway. This runway show was the first for apparel designers Yates and Stefanie White Buffalo (3 Affiliated Tribes) and their brand, White Buffalo Clothing Co. They showcased their most popular graphic tees and more. First nations designer Disa Tootoosis (Poundmaker Cree) featured her designs on the runway. Meet Matthew: 18-year-old Matthew Wesley from Tlingit Nation in Atlin, BC grew up without his culture or language, but for the last four years has taken the time to learn. He is a youth ambassador who says his elders have taught him that Indigenous youth matter and are the future. When he shares the songs he has learned, he brings a sense of empowerment and healing. His leadership makes him a great role model to Indigenous youth everywhere. ones to tell their own stories. This was a way to honor the youth leaders who attended so that they could see themselves be celebrated publicly, and inspire other Indigenous young people as future community and national leaders. The Youth These are just some of the Indigenous youth voices making differences in their communities. Many of them have overcome incredibly tough circumstances by looking to their ancestors, communities, compassion and own innerknowing. Their outlooks on life are so inspiring and valuable, serving as a reminder to all of us that no matter how hopeless life may feel, there is a way forward. These amazing youth deserve to have their stories celebrated. Meet Trina: Trina Qaqqaq is a 24-year-old Inuk youth from Baker Lake, Nunavut. She is no stranger to the hardships that many Inuit and other Indigenous youth continue to face. Despite the difficulties she has done many amazing things and is sure that she will continue to advocate for Inuit youth and Indigenous people throughout her lifetime. It is young people like Trina who inspire us to chase our dreams and reach for the stars. Meet Levi: Levi Marshall: is a proud member of the LGBTQ2-S+ community. He is 19-years-old from the Membertou First Nations from Nova Scotia currently living in Toronto, Ontario attending film school. There were times in his life where it was hard to accept himself, but he’s risen above it and exudes confidence everywhere he goes. Levi is someone who deeply cares for the people around him and makes you feel comfortable in your own skin. Meet Natasha: Natasha is an 18-year-old poet from Peavine Metis Settlement in Alberta. She is a warm and caring person who puts her heart into everything she does. Through the darkness in the world, she hopes people will make it brighter by loving more. Natasha has the amazing ability to create happiness in the world with her big heart and bright spirit. These are just a few of the Indigenous youth making a huge difference in the world. We want to continue to uplift and share the important voices of Indigenous young people, changing the way they are viewed by the media and public. If you are a youth yourself, we want you to know that you matter. We’re asking that you continue to uplift the voices of Indigenous youth by sharing these stories or sharing your own. You can do this by following We Matter’s Instagram, Twitter, and Facebook pages and sharing the many uplifting stories from our social media and using our hashtags, so we can find and share yours, too! Together we can make a difference and create spaces for Indigenous youth to be honored, uplifted, and celebrated. Use and search #WeMatterCampaign #IndigenousYouthRise and #StrongerTogether. â&#x20AC;&#x153;I have been talked down to, yelled at, abused on the internet, torn down mentally, and, on one instant, physically attacked for my views and designs. This work is something I believe in wholly, and it is something I feel should be done at full force or not at all.â&#x20AC;? On the Cover can pop culture” and “Native American art.” How does this make you feel and why is this a positive thing? patterns, but once we figured it out and made it work, it came out so beautiful. I have to admit that I am difficult on myself. It has helped me succeed in some cases but has also held me down. I love that my community is beginning to recognize my work, but I don’t think I will let myself slow down until that statement reads that OXDX is synonymous with “American Pop Culture” and “American Art.” I feel normalizing ourselves with popular culture will bring with it equality, opportunities for all deserving Native artists, and capital back to our communities. This year, I was so humbled and excited to collaborate with Jamie Okuma on two couture dresses for her runway portion of the Santa Fe Indian Market Couture Fashion Show. I had a fashion show the night before, and I couldn’t bring myself to announce it to everyone there without my voice cracking. I’ve admired Jamie’s work, her work ethic, and skill for so long, I am amazed to have this opportunity. As I was standing at the end of the runway when the dresses walked down, I saw the reaction of the audience and how dresses flowed and shined in the light. It was a beautiful moment. Your style of art and business makes you stand out and ahead of everyone else. How do you set yourself apart? Why is it important? I believe transparency goes a long way. Especially within the world of capitalism, big business, and backhand deals. I think the way we have grown organically is the truth we put out there. We are honest with our customers when we F up, or when we are figuring things out, or when we feel proud of ourselves. It gives us all a connection in that you, as a customer, are dealing with honest people and in return, we understand that each customer deserves special respect. As far as my art, I am inspired by everything I come in contact with. I can credit that a lot of my work looks the way it does because I don’t exactly have the school taught, or industry knowledge about how to do it. I’m figuring all this out as I go. We are all kind of on this journey together. What is the future looking like for you and your team? We are really in a position to start cut-n-sew productions. It has been on my mind a lot lately. As well versed as I am with the screen printing world, I want to be that with garment construction as well. I hope OXDX can employ more homies and we can begin to take steps for a building of some sorts to house all the creative power the Native world can offer. Lastly, we just announced our collaboration with Seattlebased company Eighth Generation on a new wool blanket design titled “TRIBUTE.” I happened upon this opportunity by applying to Louie Gong’s design contest and won along with Tsimshian artist David Robert Boxley. I feel like when I was coming up in this business, there wasn’t a lot of collaboration and everyone fended for themselves. The times have changed, and people are looking to strengthen all our businesses and art through each other. It’s a beautiful way to create, and I love doing it. What is your contribution to the movement of getting accurate representation for indigenous peoples in the mainstream fashion industry? OXDX works our asses off around the clock to create new, creative, and unique content for our social media. I think that’s what we all need to do, tirelessly. We will throw our version of the world in people faces until we are recognized as competitors and collaborators. Everyone’s story needs to be told. What are the responses you receive for your work? How do you handle harsh criticism? Tell us about your newest collaborations? Why do you collaborate and partner up to design with other Native American artists/businesses? Currently, I handle my criticism’s with a puff of CBD oil and an angry playlist. I wish I had something more poetic to answer but criticism is something I suffer at handling well. I would find it hard to navigate this world without the uplifting conversations I have with my closest friends. I’m learning every day to choose my battles, to confide in only genuine people, and to take the hard swallowed pill that I am the last person that will let things get to me. I have the choice to turn all these little negative aspects of the business and look at the brighter side. Hopefully, I can become better at it. Follow along with Jared’s journey and more OXDX news by visiting his blog TMBLWDS at oxdxclothing. com. In the more immediate future, I will be hosting my very first art show and soon after the team will be showcasing our Fall release through our annual Fall Fashion event. That will be hosted here in Phoenix, Arizona and will be occurring sometime in October. Modern Day Warriors They’re not only mothers, grandmothers, educators and community leaders. They’re also warriors. reast cancer touches the lives of many in Indian Country. Either yourself or someone you know has battled breast cancer and won or lost. According to the Native American Cancer Research Corporation, even though cancer incidence is decreasing among whites, it continues to increase among American Indians and Alaskan Natives. It’s also become the leading cause of death for Alaska Native women and is the second leading cause of death among American Indian women. Although it’s no surprise that it continues to be present in American Indian communities throughout the United States, there seems to be little awareness about it due to cultural beliefs, language barriers, miscommunication, and poverty areas. Above all, please remember, a cancer diagnosis isn’t a death sentence. With early diagnosis and treatment, you increase your survival rate. Here, you’ll meet two Northern Arapaho women who stood on the frontline in their battles with cancer and won. They’re more than survivors. They’re warriors. spread to my lymph nodes and that required an additional two surgeries. I was not able to use my right arm (and I’m righthanded ) and everything had to be learned again. I immediately started physical therapy at Teton Therapy in Riverton, Wyoming and met some amazing people there who helped me gain my strength. My biggest struggle was that I had lost my fine motor. I had to learn how to sign my name and most devastating, I couldn’t bead. I have beaded my entire life and had a granddaughter coming and would need moccasins. I worked diligently at being able to hold a needle and pick up beads. Surprisingly, my brain had done it so many times that my fingers started to retrain and the skill came back to me. I now have made moccasins for my grandkids, sons, children at school and various other projects. The next step of treatment was radiation. After Thanksgiving, the treatments started. I attended classes at Rocky Mountain Oncology to prepare me for the next step and I met some amazing ladies. Some were young, some were older women who were fighting their second and third rounds of cancer, young mothers, people of all walks of life. I sat there learning how to care for skin with these women and thinking to myself that if they could find the strength, then so can I. The treatments started and I began to feel the effect of the radiation. Physically, I was sick. I started to fall into a state of depression. You have so much time on your hands you start to over think things and start to feel sorry for yourself. So I decided I needed to do something so I planted flower bulbs because bulbs are kind of like a promise of spring and spring to us represents new life. I planted my bulbs and decided I was going to get well. Most importantly I realized that, although I was sick, I needed the interaction of the kids at school. My job made me strong! I got lots of hugs a day and I had people who were genuinely concerned and helpful. For that, I am forever grateful. My road to recovery has not been easy but I’m thankful for my family and friends who have supported me through this journey. I am especially grateful for the modern medicine and our traditional medicine that has helped me to be here today. Don’t take life for granted. Live each day to its fullest and be happy! Wyoming Indian Elementary School before recently retiring. About thirty years ago, I was diagnosed with breast cancer. I underwent a lumpectomy, radiation implants and radiation treatments in Casper, Wyoming. About ten years ago, cancer aggressively came back. I was sent to the Huntsman Cancer Center in Salt Lake City, Utah for more surgery, treatment and radiation therapy. This was a very difficult time for me and my family. I can now say I am cancer free and enjoying life with my family. My native ways, beliefs, and prayers helped me through the tough times. Marika Sila We catch up with Indian Countryâ&#x20AC;&#x2122;s most talented female hoop dancer Marika Sila. Hoop dancing has taken Inuvialuit actress, fire performer, yoga teacher and self-professed "hoop ninja" Marika Sila across the world, such as Greece, Rome, Venice, and Budapest. She performed for audiences of all sizes, from small youth workshops to enormous festivals overseas. By the looks of her videos she posts of herself performing on Instagram (she boasts more than 20,000 followers! ), it'd be hard to believe that she started hoop dancing just four years ago. We catch up with Indian Country's most talented female hoop dancer of the moment about her hooping adventures and what inspires her to keep going. Where are you originally from? I was born in Yellowknife, raised in Canmore AB, but my family is from Tuktoyuktuk, NWT. I am Inuvialuit, also known as a proud Canadian Eskimo. What did you do before hoop dancing? I was a competitive cross country ski racer for 15 years of my life. I trained hard for it and won many national level medals for my age category at the time. I was good, but it was not my passion. All my life I wanted to be a hip-hop dancer, but I did what I thought would make my family happy for so long until I quit at age 17. For a while, I got caught up with the wrong crowd after I didn't have a clear goal in mind. I was living with my uncle at the time who struggled with alcohol abuse, and I wanted to help him get sober, so I started my journey of sobriety to try and help him with his addiction. Sadly, we eventually lost him to the addiction about five years ago, and since then I have been dedicated to living a life of sobriety, health, and wellness. I have started a company with my partner called RedPath Talent. We perform at weddings, corporate events, festivals, and host workshops and youth empowerment seminars focusing on the power of sobriety, anti-bullying, self-love and the protection of Mother Earth. When did you get into hoop dancing? career. What actresses and music artists do you look up to? Natalie Portman is my favorite all time actress. And music wise, Cardi B is a massive inspiration to me, but Beyonce will always be number one. Iâ&#x20AC;&#x2122;m a sucker for hip hop and R&B music. Music is my fuel when I am dancing. It fuels my inspiration, and I believe it is so essential for anyone to stay inspired in life no matter what they do, whether they are an artist or not. Staying inspired gives me more energy than any energy drink, or more energy than any amount of rest could ever give me. Whatâ&#x20AC;&#x2122;s your advice to anyone interested in hoop dancing? Whenever you're starting something new, you have to believe you can do it, and be willing to go through the first awkward stages. Everyone goes through it, and don't get discouraged when it gets hard. Repetition is the key to mastery. When you drop the hoop, dance it off. Every hooper, even the best hoopers in the world still drop their hoops. If you get mad at yourself when you drop your hoops it won't be any fun, laugh it off and enjoy the process. The process is the most fun part. I believe life is about having as much fun as possible and enjoying the small things in life, like family dinners, laughs with your friends, hikes in the mountains and plastic circles. On Our Radar What we’re on the lookout for in the world of entertainment. dozens of first-person stories by writers, actors, athletes and community leaders such as LinManuel Miranda, Issa Rae, Jeremy Lin, and Ferrera herself. The book is filled with first-person accounts made distinct with each author’s individual voice. You can purchase the book at https://www.amazon.com/ american-like-me-reflectionscultures/dp/1501180916. New artwork by indigenous artists Kristina M. Bad Hand and Elizabeth LaPensée explores the intersection between pop culture and Native life. Through art, including comic books and video games, the artists re-envision future and contemporary cultural realities and Indigenous perspectives. Kristina and Elizabeth will be at the art opening. Event is Friday, October 5, from 5pm-7pm at Museum of Anthropology in University of Denver (2ooo E. Asbury Ave. Denver, CO 80210. Reception to Meet the Artists @ 5 pm; and Artist Talk @ 6 pm. October and November are months to celebrate our indigenous cultures, and our brothers and sisters who are currently fighting or fought their battles with breast cancer.